Molded Paper Pulp: What Is It? Molded paper pulp is made from recycled materials to produce biodegradable, compostable, disposable products. It is often used for packaging and food storage as well as for creating disposable food containers and drink carriers. It is more eco-friendly that other disposable products such as foam and plastic. A disposable food container made from paper pulp is 100% biodegradable, totally recyclable and it takes minimal energy to produce it on top of the fact that is produced with post-consumer waste. This is a true solution to using sustainable products to protect the environment and ecosystems. Corporate eco-friendly commitments go far in the eyes of a consumer. Believe it or not, there are more and more people who are committed to living green and protecting the ecosystems and environment. They will do business with establishments that support the same principles. If you engage in environmental marketing, beware that many consumers do notice that the practices of a business do not meet the expectations of being truly environmentally friendly. If your food service business is environmentally committed, using this type of disposable tableware will support your principles as well as impressing consumers who share the vision of a better, waste conscious world. Food service distributors offer wholesale disposable tableware made of molded paper pulp specifically designed for use in food service establishments. This pulp tableware includes disposable food containers like meal trays, plates, clam shells, beverage holders, cups, and bowls. Divided plates and food containers are also available. 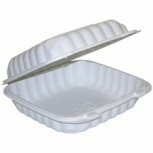 This type of material is perfect for takeout meals as well as serving if you use disposable products. It is consumer friendly as well as environmentally friendly. So, why not take the step in creating a business that is waste conscious and environmentally friendly? Learn more about distributors of biodegradable food service products. These days, environment consciousness will go far in creating a vision of a business that consumers will admire and support.